Researchers at The Pirbright Institute have created a new vaccine technique of genetically modifying the Marek’s disease vaccine so that it is able to protect against another destructive poultry virus called infectious bursal disease (IBD), and potentially others such as avian influenza and Newcastle disease. This approach could lead to a reduction in the number of vaccines that need to be administered to each bird. For the first time, Pirbright scientists have been able to use a new vaccine technique: a gene editing system called CRISPR/cas9 to add a gene of the IBD virus into a current Marek’s disease vaccine virus. The added genetic material protects poultry against IBD in addition to the protection already offered by the Marek’s disease vaccine, meaning that bird owners would only need to use one vaccine instead of two. Other vaccines exist that achieve a similar result, but by using the CRISPR/cas9 system the Pirbright team have been able to insert the IBD gene far more quickly, easily and accurately than the methods that have been used before. 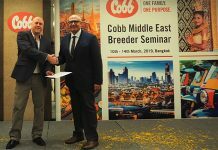 This will significantly reduce the time needed to generate new vaccines, which will help to protect poultry quickly against outbreaks of new strains. Researchers at The Pirbright Institute have created a new method of genetically modifying the Marek’s disease vaccine so that it is able to protect against another destructive poultry virus called infectious bursal disease (IBD), and potentially others such as avian influenza and Newcastle disease. This approach could lead to a reduction in the number of vaccines that need to be administered to each bird. 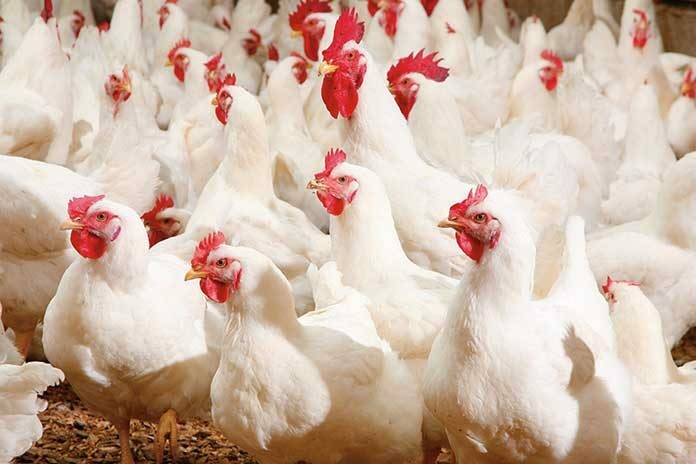 The team intended to create a vaccine that will be able to protect against multiple avian diseases and will next target two high consequence poultry viruses – avian influenza virus and the Newcastle disease virus. The flexibility of the new method also means that as the viruses evolve, the vaccine virus can be easily edited to include new genes, which protect against emerging strains. There has been huge commercial interest in using this technology to develop novel vaccines, so Pirbright scientists intend to partner vaccine manufacturing companies to bring CRISPR/cas9 edited vaccines to market. This scientific paper can be found in the Vaccine journal and was funded by the Biotechnology and Biological Sciences Research Council (BBSRC); grant numbers BB/P016472/1 BB/L014262/1. 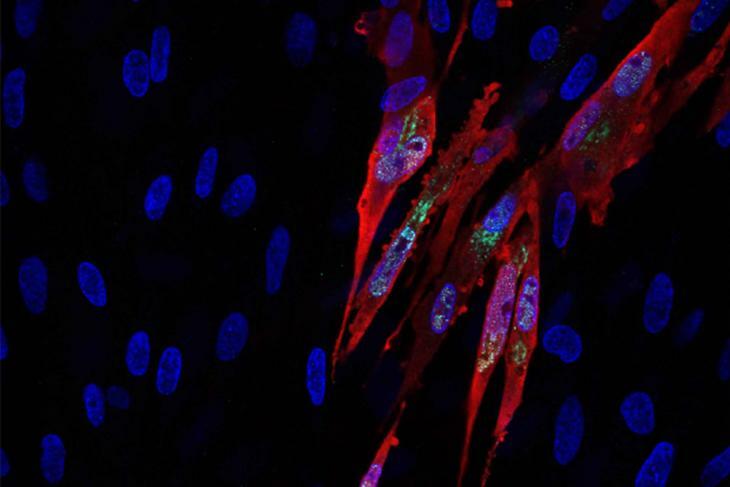 Cells infected with the Marek’s disease vaccine virus, HVT, (green) expressing the inserted infectious bursal disease virus gene, VP2 (red). Cell nuclei are shown in blue. Image by Dr Na Tang, Viral Oncogenesis group.